NEW YORK/ ADDIS ABABA, 1 September 2016 –In the top 10 countries with the highest rates of children missing out on primary education, nearly 2 in every 5 children – 18 million – are out of school, UNICEF said today. Liberia is home to the highest proportion of out-of-school children with nearly two-thirds of primary-aged children not accessing school. The second highest is South Sudan, where 59 per cent of children are missing out on their right to a primary education and 1 in 3 schools is closed due to conflict. Afghanistan (46 per cent), Sudan (45 per cent), Niger (38 per cent) and Nigeria (34 per cent) also feature in the top 10 countries with the highest primary out-of-school rates, painting a clear picture of how humanitarian emergencies and protracted crises are forcing children out of school. The UNICEF data analysis, which comes as millions of children return to school this month, highlights the extent of an education crisis affecting countries already blighted by conflict, prolonged periods of drought, flash floods, earthquakes and high rates of extreme poverty. UNICEF fears that without education, a generation of children living in countries affected by conflict, natural disasters and extreme poverty will grow up without the skills they need to contribute to their countries and economies, exacerbating the already desperate situation for millions of children and their families. Education continues to be one of the least funded sectors in humanitarian appeals. In 2015, humanitarian agencies received only 31 per cent of their education funding needs, down from 66 per cent a decade ago. Despite a 126 per cent increase in education requirements since 2005, funding increased by just 4 per cent. Moreover, education systems equipped to cope with protracted crises cannot be built on the foundations of short-term – and unpredictable – appeals. During the World Humanitarian Summit, held in May 2016, a new global funding platform, Education Cannot Wait, was launched to bridge the gap between humanitarian interventions during crises and long-term development afterwards, through predictable funding. Though not one of the top 10 countries with the highest rates of out-of-school children, Syria is home to 2.1 million school-age children (5-17) who are not in school. An additional 600,000 Syrian children living as refugees in the surrounding region are also out of school. Recent, reliable data from countries including Somalia and Libya are not available either from administrative or survey sources partly due to the continuing conflicts. “For countries affected by conflict, school equips children with the knowledge and skills they need to rebuild their communities once the crisis is over, and in the short-term it provides them with the stability and structure required to cope with trauma. Schools can also protect children from the trauma and physical dangers around them. When children are not in school, they are at an increased danger of abuse, exploitation and recruitment into armed groups,” said UNICEF Chief of Education Jo Bourne. 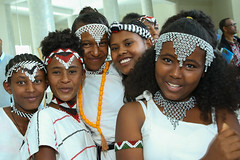 Ethiopia has made remarkable progress in the past two decades towards universal primary education. Primary school enrolment is up, and mobilization efforts are enrolling school‑age populations across all regions. However, the number of out-of-school children remains high, and only just over half of all students who enter grade one complete a full primary education cycle. 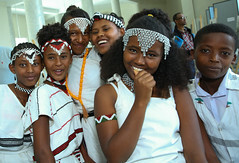 The Government of Ethiopia has continued its strong commitment to ensuring accessible, quality schooling for all as captured in its Education Sector Development Plan 2015–2020. Drawing on Education Management Information System (EMIS) data for 2014/15, over 2.6 million children are estimated to be out of school. These out of school children represent “the most difficult to reach” population comprising of the last 10 per cent of the eligible school population. 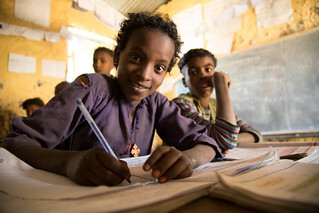 In 2012, UNICEF commissioned a study on the Situation of Out-of-school Children in Ethiopia which led to a large media based ‘Go-to-school Campaign’ to reach to out-of-school children and accelerate their enrolment. In 2014 alone, the national campaign brought back 47,511 out of school children in the four developing regional states of Afar, Somali, Benishangul-Gumuz and Gambella. 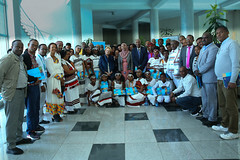 UNICEF, through its programme of cooperation with the Government of Ethiopia, has supported the Ministry of Education in the establishment of over 1,600 Alternative Basic Education Centres (ABEC) which have enrolled 276,777 students in marginalized localities. In conjunction with other Development Partners, a national Strategy on Education for Pastoralist Communities has recently been revised and provides a strong basis by which children in remote areas will be able to better access relevant educational services.